Please enquire for any other quantity. Your bear will come home to you well protected and boxed. It will travel by Royal Mail First Class 'Signed For' service (what used to be called Recorded Delivery). This needs a signature on delivery and usually arrives the day after posting although this is not guaranteed so please allow up to 3 working days. 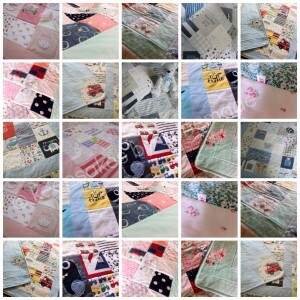 One quilt- £11 – Royal Mail 'Special Delivery' and needs a signature on delivery. It should always arrive by 1pm the day after posting. Cushion with pad- £7 – (Cover only £5 – Signed For service) Royal Mail 'Signed For' and needs a signature on delivery. Your quilt will come home to you well protected and in a plastic mailing bag or cardboard box. It will travel by either Royal Mail or ParcelForce. Bear and quilt together – £18 For other combinations, please ask. Your keepsake will be in a plastic bag to protect it from the elements should the outer packaging be damaged in transit (these things do happen sometimes), please keep these bags well away from children. The tissue packed boxes used are single wall cardboard and mailing bags are tough plastic. Both are robust enough to offer good protection for your keepsake. I reserve the right to change the methods of delivery or to split parcels if the weight exceeds postage paid. Please let me know if you require more than Royal Mail standard insurance. Occasionally I will reuse outer packaging (bags and boxes) to minimise waste and environmental impact. It will always be clean and offer good protection for your keepsake. Insurance: The insurance on all parcels will be no greater than the value of used clothing, which is minimal. 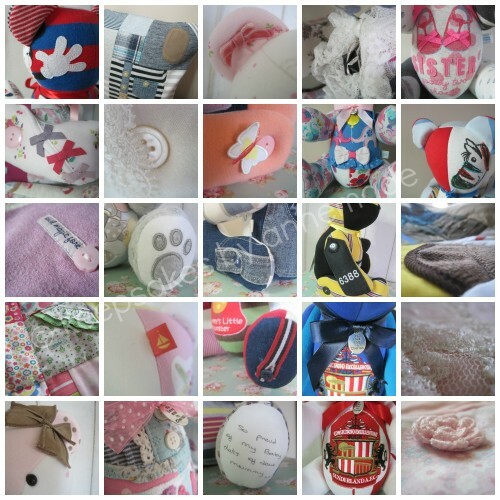 Signed For parcels have a maximum insurance value of £50 which would cover the replacement of second hand sleepsuits, but not of the sentimental value they hold. Other services offer different compensation values but rarely cover the cost of a replacement keepsake. Royal Mail prices are expensive but I don't feel I can trust other carriers with your precious memories so will continue to use them. If additional insurance is required, please ask and I'll enquire and provide a quote. International postage varies from country to country, please enquire and I will supply a quote.